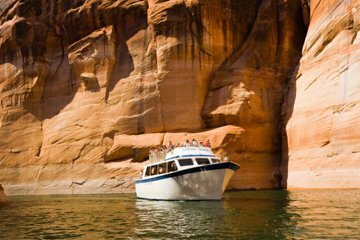 This cruise travels beneath craggy sandstone cliffs towering high above as you pass through Antelope Canyon. On your cruise you will pass the Glen Canyon Dam (the second highest concrete arch dam in the U.S.) and geological wonders not found elsewhere. Upgrade your excursion to the include a look at the “Navajo Tapestry” of the Navajo Canyon and spend more time getting to know the area.